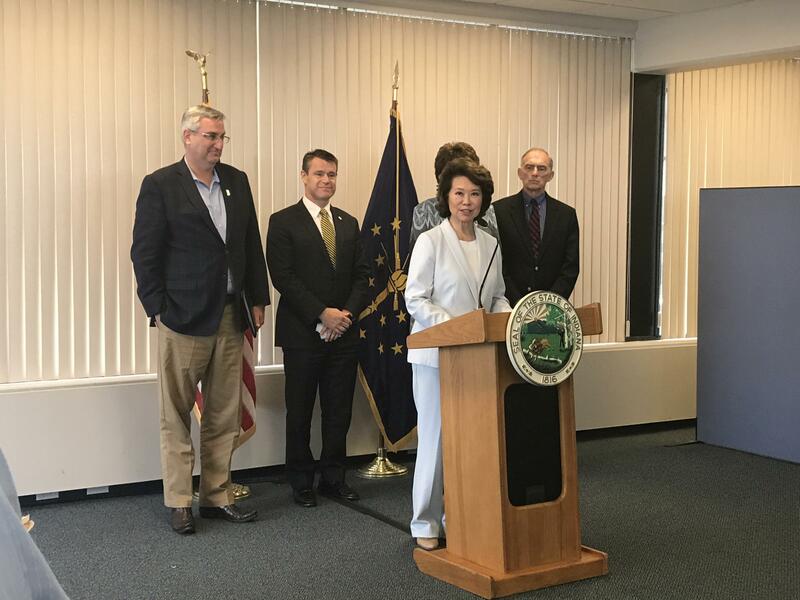 Transportation Secretary Chao addresses Indiana representatives at the South Bend International Airport. U.S. Transportation Secretary Elaine Chao met with Indiana leaders on Tuesday in the Michiana area to open Indiana’s toll road and discuss details of the South Shore Train expansion and double tracking project. Chao touted the public-private partnerships used in the two projects. She said Indiana’s work on the toll road and South Shore rail line should be viewed as models for the rest of the country. Chao’s attended the ribbon cutting ceremony commemorating the completion of $200 million worth of improvements to I-80/90, which include safety additions such as cameras, as well as general maintenance renovations, such as resurfacing. Chao also met with state and local officials, as well as representatives of the Northern Indiana Commuter Transportation District, or NICTD to talk more about the South Shore Line expansion and double tracking project. The project is intended to cut travel time from South Bend to Chicago from approximately two hours and 30 minutes to an hour and a half, creating what NICTD officials say is “an opportunity to access the world’s third largest economy”, Chicago. Chao did not discuss her thoughts on the South Shore project, as NICTD officials have officially submitted an application for the federal funding portion of the project. Republican U-S Senator Todd Young said Chao’s visit is essential when it comes to the future of that project. “One of the things that's looked at the federal level is how much state support, local support you have,” Young said. Young noted the South Shore has been a bipartisan effort for years and said that Indiana is typically forward-leaning when it comes to transportation projects.